Whistler Blackcomb is the greatest resort success story on our continent – from humble beginnings in 1966 to a resort municipality with 53,000 beds, Olympic host and the first to draw two million skiers in a season. While Whistler and Blackcomb mountains were developed independently, they are now linked by one of the most iconic ropeways ever built. Today, the mountains have a fleet of thirty lifts including seven gondolas and 14 detachable chairs over 8,200 sprawling acres. Despite being the largest ski resort in the US or Canada, W-B still gets crowded and has opportunities for continued improvement and expansion. The resort’s master plan prescribes replacing nine lifts and adding eleven more, primarily on Whistler Mountain. Many of the lifts add new out-of-base capacity with the goal of “staging” both mountains with 32,000 skiers in 2.5 hours or less. On the Whistler side, the plan includes a major expansion to the south, creatively dubbed Whistler South. It would include an 8-passenger gondola from a new “Cheakamus” parking area and another base facility part way up. At just 2,000 feet above sea level, The lower base would have no trails to it, just the gondola to the upper base area. A second gondola would connect to here from Whistler Creekside. Trail pods above would include a beginner area and three detachable chairlifts including one in Bagel Bowl. Whistler’s Master Plan includes removing 5 lifts and adding 14. The Creekside base would also get a fourth gondola direct to Whistler’s Chic Pea, bypassing the Creekside Gondola/Big Red choke point. Higher up, Franz’s chair and Whistler’s two original T-bars would be replaced by a single detachable quad from the bottom of the former to the top of the latter. At the heart of Whistler Mountain, Emerald Express is slated to be swapped with a six-pack. The quad would move to a parallel alignment ending slightly higher. Talk about an increase in capacity! If you’ve ever been in Symphony Bowl, you know the high speed quad built in 2006 serves an area larger than most ski resorts. As such, Whistler Blackcomb plans two more lifts starting at the Symphony base fanning out in opposite directions. One called Robertson’s goes towards Harmony while the other serves either Flute Peak or Flute Shoulder with a detachable four or six-passenger chair. Access to the alpine from Whistler Village stays exactly the same; the only change on this side of the mountain is replacement of Magic (a Yan triple) with a 6/8 chondola. The story at Blackcomb is thoughtful lift replacements and realignments rather than outright expansion. A high speed quad would extend from Blackcomb Base II (the mid-station of Excalibur) to the base of a new Catskinner, which would also be a high speed quad. Excalibur would get a third section to Glacier Creek Lodge, which was the plan ever since it was built in 1994. Like at Whistler, the Magic chair would be replaced with a beginner-friendly combination lift. Blackcomb will lose four lifts and add at least six new ones. Perhaps most interesting at Blackcomb is a new aerial tramway from the Rendezvous Lodge over Couloir Extreme to Horstman Hut with no intermediate towers. This would eliminate the school bus ride to 7th Heaven Express to access Blackcomb Glacier in the summer while providing another signature scenic lift. If the glacier still exists when all of this happens, Blackcomb’s two T-Bars will be replaced with a single gondola and tunnel to the backside. 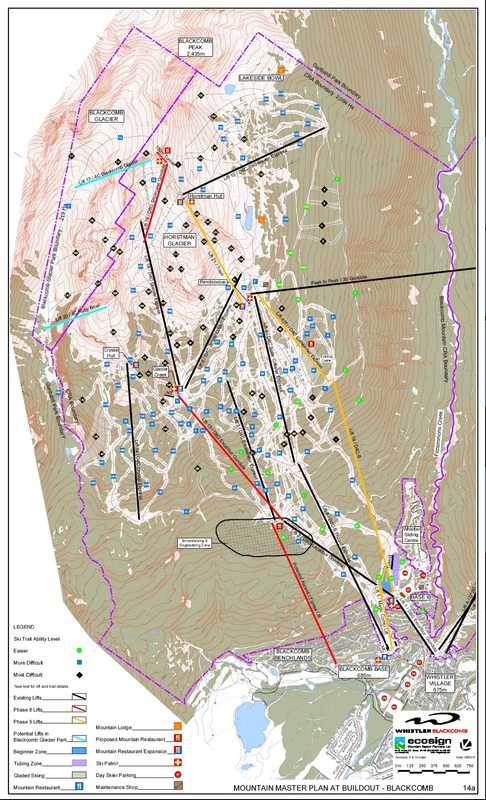 The plan notes, “the melting of the Horstman Glacier has created increasing technical problems and expense for maintaining the Horstman and Showcase T-bar glacier lifts. Ecosign and Whistler Blackcomb management have worked with Doppelmayr to find a long-term technical solution and we have recommended the removal of both the T-bars.” The replacement gondola would have just three towers located on rock to avoid the melting glacier while still serving what’s left of it. 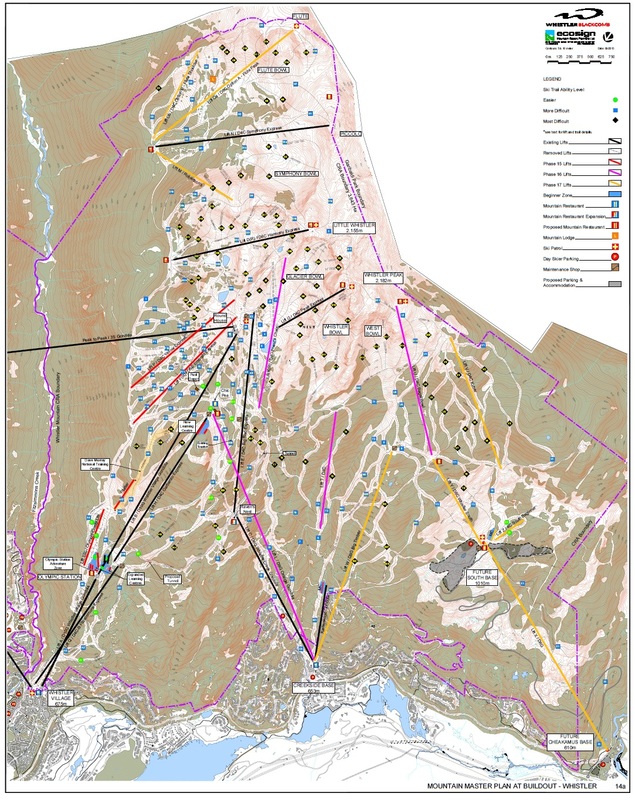 The Blackcomb master plan also identifies two possible fixed-grip quad alignments in Ruby Bowl if a lift was ever permitted in the Blackcomb Glacier Provincial Park. Some of these projects are on a nearer burner than others. I think we will see Excalibur Stage III in the next few years on Blackcomb along with the Emerald six-pack on Whistler. The former project will make Excalibur and Jersey Creme the summer route to Peak 2 Peak, giving Wizard and Solar Coaster a much-deserved break. The Bagel Bowl lift on Whistler Peak will likely be built long before any lower-elevation development at Whistler South. Unlike some master plans, all of these projects will eventually come to fruition if Whistler’s history is any indication. You can check out detailed plans here. Seeing as they did the Blackcomb Gondola instead of a third stage to Excalibur, and used the original Emerald quad to upgrade Catskinner rather than build a Yellow Express, clearly some parts of the plan will never be implemented. I do wonder if Whistler will ever put those high speed quads in the Bagel Bowl area down, as they would eliminate the need to do a two-lift cycle on Big Red and Peak Chair when lapping that area, and would open up some new terrain in that area (though the master plan lays it out like you’d have to use Peak Chair to get to all of these pods).